This morning I was given privilege to deliver my closing speech in church (the same one I delivered at the final PBS committee meeting 2 weeks ago) to inform the congregation that Pusat Berdikari Seremban is now formally closed. Pastor Paul Christie prayed for the continuing work of the Persatuan. I felt good at the way PBS work has been handed over to Persatuan and although I am apprehensive over the great potential Persatuan can reach I am also aware how insignificant I am in this vast sea of change and progress. I am humbled by all the help I have been given and must admit that Persatuan will not get to where I envision unless my team give me its continuing support. People have been telling me that it is bad timing to raise money during recession. It is generally true that pockets are less deep when economy is bad but the key word is 'generally'. In the hearts of charitable people and organizations, recession is not an overcoming factor to decide how much, or how little to be given out. In fact, the reverse can be true, that because the needs are constant, recession should NEVER be a reason to give less. Welfare centres like ours are in constant need to finance our work and look toward a steady stream of resources to put our mind at ease. The 'Mama Mia!' musical is ongoing at the Istana Budaya, Kuala Lumpur. I read with interest how the Star Foundation and SP Setia Charity Foundation are actively raising funds to support the works of selected welfare centres throughout the nation that cannot survive financially on their own without such public donations. Recently I also read of another charity called the Budimas Foundation carrying out similar works but with a different focus. Here in Malaysia I believe that charity is in the core of many people and organizations. Not because they get any returns but they just find it so natural to be helpful. Isn't that so Malaysian? And this makes me really proud to be one, in spite of the many negative political talks about race, religion and government policies in the various blogs. Charity foundations are very common in the west. I google that term and come up with many such foundations in the United States that aid the handicapped families, small businesses and welfare homes. Most are for those within the nation although they do support international needs but qualifying conditions are stiff and competitive. As more and more centres vie to get limited supports the chances of getting a reasonable sum is harder. As such it seems that to be in the race one has to impress as well as do very well to earn that support. The philosophy of any foundation work is to give to those that deserve to be helped. In the coming years I guess we have to work real hard to join the category that 'deserved to be helped'. Like the proverb in Bahasa Malaysia says, 'Sedikit sedikit menjadi bukit', translated to mean 'Bit by little bit a hill will be formed', so we will need the charity from many hearts to build up the required financial base to enable our work to be discharged without any anxieties even in recession times. Our faith is that recession is NOT in the equation of charity. And I hope that our supporters feel the same way. Betsi let in a secret this morning. We have 93 partners at last count since we launched the Partnership Program almost exactly a year ago. Some paid more than once in the year and we thank all of them for their generosity. Without partners and volunteers we would be nowhere in this work, really. Christmas comes in just a week from now. I pray that our spirit of joy will not be in any way dampened by the current global economic recession. Think through this: Jesus Christ was not born in a predictable, safe or comfortable place. Yet he grew up in a warm and loving family and help restore broken relationship between men and between men and God. If Jesus had been born into a well-to-do family and a safe environment how can we expect Him to understand many of our predicaments of life? But He did, because He was there, done that and understood the ebbs of our difficult times. Therefore let nothing tough influence the true joy of Christmas, because Christmas is about God among humankind. Let me wish each and everyone of you who read our posts a very blessed and thankful Christmas and may your New Year bring about new hope and new resource to face the challenges ahead. May God bless you and your family and give you health and happiness. Yesterday I spent some time jotting down what I believe to be key issues Persatuan need to address in the initial years of its formation. As chairman it is my responsibility to plan for the development and growth of the Persatuan. Infants need breast milk or infant formula to build up strong bones, healthy bodies and brains to prepare for their childhood. Likewise we need to be similarly provided to grow up strong. Financial Resource - We need to build our Partnership Programme, Corporate Sponsorships and Donations from Welfare Foundations to be financially adequate to meet our expected growth. Capacity Building - Our centre is fully subscribed. We need new space to grow. 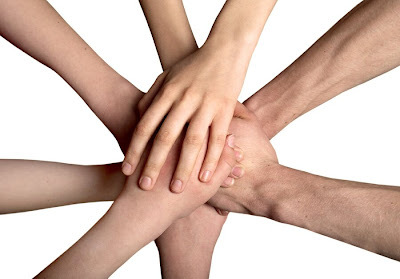 Human Resource - With growth comes the need to recruit more staff and volunteers. Publicity & Awareness - New brochure, updated website and blog and newsletters to keep our supporters and visitors informed. Social Networking - Create bases for parents and trainees to interact, share and encourage. Skills Training - Improve on the quality of skills we possess and impart to the trainees. There is much work ahead of us and many people are needed to help bring them to fruition. We need people to offer their skills connected to the above key areas to take Persatuan to the next level. Presently the available resources within the committee, Persatuan membership, trainers and volunteers are not enough to achieve them. More help are needed. A symbolic meeting was held this morning to formally close the work of Pusat Berdikari Seremban. Over the past 5 months Persatuan had gradually taken over Pusat's work and it is fitting to end this chapter of Pusat and hand over the work completely to Persatuan. Several resolutions were passed and the chairman gave his closing address below. It gives me great pleasure, honor and privilege to deliver this closing address of Pusat Berdikari Seremban. 10 years and 6 months ago I remember attending the dedication service of this training centre officiated by the late Rev. Paul George Ponniah on 31st May 1998, 5.30pm. On 1st June 1998, PBS was officially launched with 17 trainees under the care of a staff trainer and a group of 13 volunteers. 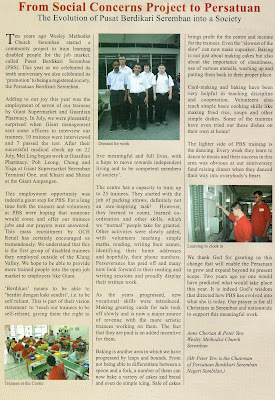 From the time when the idea of setting up this centre was mooted by the Social Concerns Committee of Wesley Methodist Church Seremban to the LCEC on 23rd May 1996 to its inception, much work had been put in by both the church leadership and Malaysian Care who undertook the advisory role in setting up of the centre, putting a workable system in place and training the trainers and volunteers. No single party is more important than the others, all play important roles in ensuring that PBS was safely delivered and nurtured. We thank God that we enjoyed unity and passion in this work. Over the years we have realized our vision of training self reliance to many of our trainees. In so doing we have indeed changed their lives for the better. And this is our reward, to be part of the life-changing process. Unlike some of similar centres which choose to take the route of immediate registration as societies, PBS chose to remain within the church and waited for the right timing which came 10 years later. Therefore, when PBS celebrated her 10th anniversary on 5th July 2008, it was a fitting closure to a social ministry that began quietly, grew steadily and then blossomed into a butterfly to enable it to grow further. Persatuan Berdikari Seremban owes to Pusat Berdikari Seremban the solid foundation it is built upon. Although about the same team takes over the helm, history will record how Persatuan’s work could not have been this smooth and strong if not for the early vision and efforts of its pioneers and founders. In this closing address I wish to put on record my appreciation to every one of them. PBS shall find a place in the history of Wesley Methodist Church Seremban as the fore-runner of Persatuan Berdikai Seremban. On this note I wish to commit the continuing work to God for His onward blessing and shelter as we bring hope and joy to the learning disabled people who enter our doors. To God be the Glory! Thank you. Trainees who found work are entitled to receive a welfare allowance of RM300 monthly. We have been actively helping our trainees apply for their allowances. While some of the approval letters were sent to their homes, others came to us. Yesterday we received such a letter for one trainee who is now gainfully employed at Giant Supermarket. As he is working we presented the letter to his mother in a simple ceremony. Chong Ying Heng, congratulations! Today we celebrated Christmas by giving the trainees a party in which 6 members of the d'Nous Academy students helped in leading the singing and playing games. Sister Siew Khim told the story of God's creation. Among the guests who came were 5 members from Kuala Lumpur Wesley Methodist Church, specifically on a mission at our invitation to present us a gift. These guests are: Veronica Ting (Director, Social Outreach), Lim Pik Wah (Chairperson, Christian Social Concerns Committee), Goh Joo Gaik, Cindy Ong and Ong Jin Gay (Members, Christian Social Concerns Committee). KL Wesley had heard of our work and were touched by what they discovered and decided to help us financially. So on one Sunday recently, they took an offering for their Needy Fund which is to be channelled to us. We were 'shocked' by the amount they gave. It came to RM16,794.70! A private donation of RM300 also came with the group. We were very touched by this gesture of fine charity and kept the faith that there are many caring Methodists in this country. To KL Wesley in general and those who gave to this work in particular, we want to record our heartfelt 'Thank You' for being our partners. The trainees are the more blessed because of what you gave. The following article was published on our work. Double click for the enlarged size. Hi, is it December already? Time for some of us to start Christmas shopping, writing our Christmas greeting cards, organizing family year end get-togethers and parties. We are already selling our trainees prepared and packed Xmas cards at RM5 for a set of 2. We welcome you to buy them from the centre. Call 06-7632005 for details. Oh yes, PBSNS will have her annual X'mas party on December 11. Do drop by around lunch time and enjoy some fun singing with the trainees. I'm sure they will enjoy your presence. If you have been our Partner when we launched the program about a year ago we would appeal to you to stay connected with our work by continuing as a partner again next year. It cost just RM120 a year and the amount will go towards financing the centre's operating expenses. Please mail us your donation to the address given at the top of this blog. Thanks.